Organizations delivering citizen and customer centric services like Registration, Issuance of Certificates, Permits etc., involve extensive handling of documents. These documents are critical for effective service delivery. With increasing number of documents generated every day, storing and retrieving documents become an operational challenge. Many such organizations convert these documents into images through scanning. In most of the cases it is not being done appropriately as it is a human intensive and costly process. This leaves the organization with digital images which cannot be retrieved and data cannot be processed. If one organization has already having the scanned documents/images; DIP can help them to extract the relevant data from the same and provide with the data extracts in a usable format. 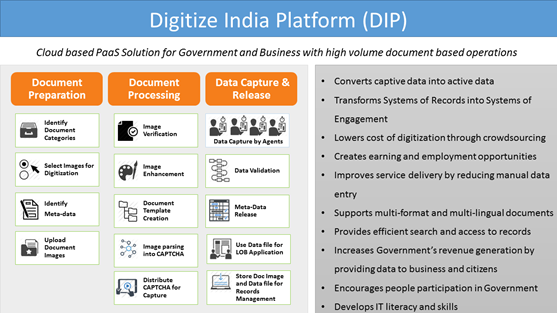 DIP provides an innovative solution for all these challenges by combining Machine inputs with human intelligence to deliver logically verified data which is being depicted below: If one organization are still using paper based document, DIP can convert them into images and digitize them. Repurpose, reproduce and share the data in different formats for ex. Printed forms, PDF files etc. Type of Data/Documents digitized using DIP? For detailed user sign-up process, please click here 1.13 MB. For list of empanelled Agencies under DIP Platform, please click here 221.14 KB.